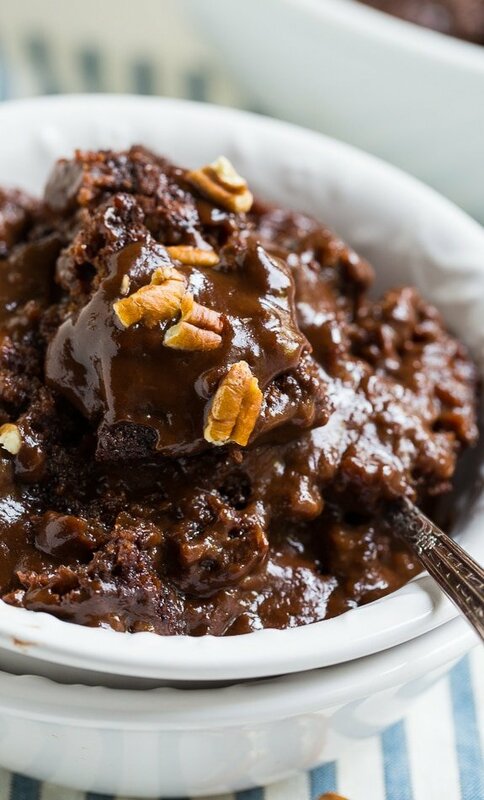 With a brownie-like top and a rich fudge sauce on the bottom, this Chocolate Cobbler is like a molten cake but much easier to make. During the summer months I like desserts that are quick and easy and can be made ahead of time. There is so much spur of the moment entertaining that goes on, it’s nice to be prepared. Cobblers are my favorite summer dessert and I love them with peaches, blackberries, or blueberries. But sometimes you just gotta have a little chocolate. And that’s when this Chocolate Cobbler recipe comes in handy. 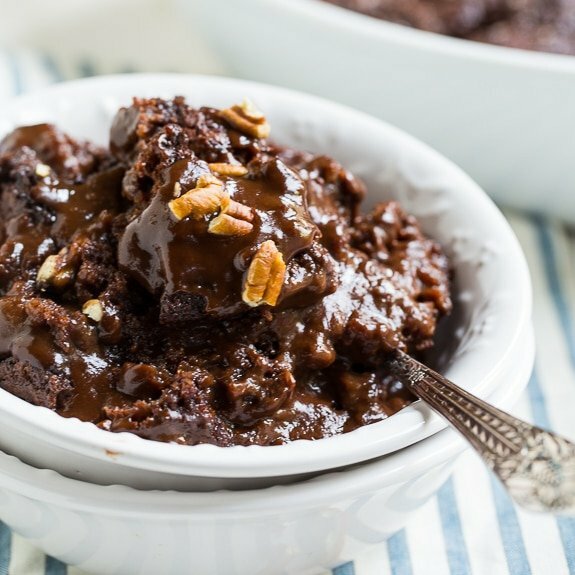 It has a rich, fudgy chocolate sauce that magically forms on the bottom of the baking dish as it cooks. The top is like a cakey, chewy brownie. This is an old-timey recipe of which you see slight variations. It falls under the category of simple and inexpensive recipes that make use of what you already have in your pantry. Make this Chocolate Cobbler taste even better by using homemade vanilla extract. This is pure fuss-free, lip-smackin comfort food. I like to use a few pecans, but you can leave them out. Serve warm from the oven with a scoop of vanilla ice cream for a southern dessert that will leave everyone swooning. If you have any leftovers, they taste great cold, straight out of the refrigerator. 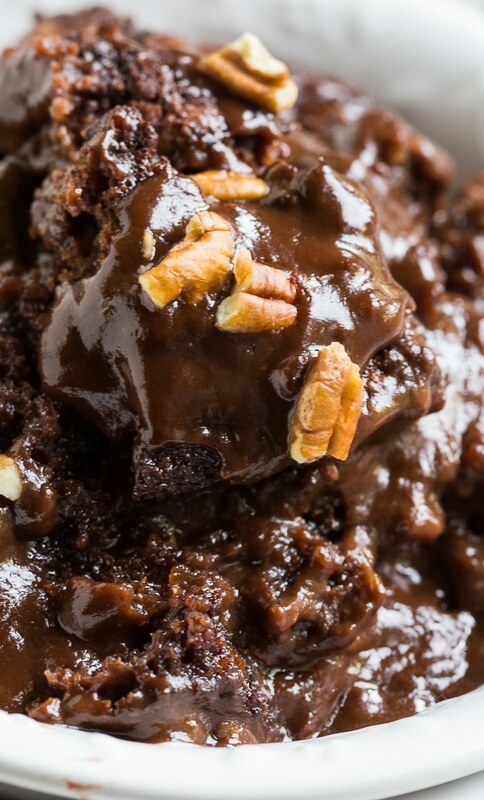 For more fabulous southern desserts follow Spicy Southern Kitchen on Pinterest and Instagram. In a medium bowl, stir together 3/4 cup sugar, self-rising flour, 3 tablespoons cocoa powder, pecans and salt. Add milk and vanilla, stirring until smooth. Pour melted butter into an ungreased 1 1/2-quart baking dish. In a small bowl stir together remaining 1/2 cup white sugar, 1/4 cup brown sugar, and 1/4 cup unsweetened cocoa powder. Sprinkle evenly on top of batter. Pour not water evenly over top. Bake for 35 to 40 minutes. Let stand 5 minutes before serving. Top with vanilla ice cream and pecans to serve. 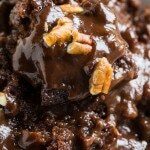 This entry was posted in Desserts, Other Desserts and tagged chocolate, cobbler. Bookmark the permalink. I think it is better right out of the oven but it can be made ahead. Can this Recipe be Doubled for a 9X13 cake pan????? Can this Recipe Be Double for a 9X13 pan????? Yum! Bourbon Pecan Ice Cream is perfect for this! Please tell me what size baker you used and what size serving ? You state 6 servings but what size are the servings. I want to do this for a large group but there will be other desserts and treats there as well. Most will probably have no more than a tablespoon at best. How do you make this ahead? This recipe is sinfully delicious! Hi Christin !!! Thank you so much for this recipe! I searched and searched everywhere; not only did I not locate the product but I was unable to find a recipe that even vaguely resembled this delightful treat. I never thought to explore “cobbler” though. When I stumbled upon your “Chocolate Cobbler” today, I was so excited to finally have the exact recipe for my favorite treat, and from scratch as well…. so perfect!!!! I am certainty in your debt as well as your new biggest fan. I’ve had & used this recipe for over 40 years. It calls for 1 cup flour & 2 teaspoons baking powder. Made this today and it was amazing. It seemed really thin, but I don’t ever bake cobblers. So maybe it’s the norm. Everybody enjoyed it and complimented the chef. This is awesome and easy to try as well.. we can replace any nuts in place of pecans right. This looks like a dessert that I’d need to have a glass of milk with. That is not a bad thing! It looks sooooo rich and delicious! Oh man, this looks so decadent. 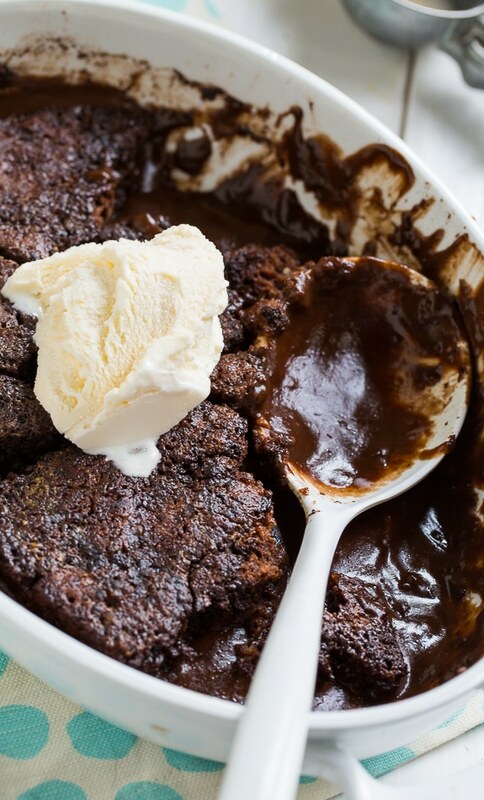 Chocolate beats fruit cobbler any day! LOL! Especially when it’s this fudgy! Oh my gosh, this looks heavenly, Christin! A chocolate cobbler is brilliant! I love how easy it comes together too! What…..how is this possible. I am dying over these pictures and this dessert. I need it NOW!!!!!!! I am absolutely making this for our next dessert. I don’t think anything has ever looked so delicious! I have a chocoholic friend who would flip over this dessert. She would love, love, love this (as do I)! I’ll need to make this the next time we get together. This looks heavenly! Fruit cobber is soooo passé to me now 🙂 Pinning! I want to dive into that! Someone would need to restrain me! Love it, Christin. Have a great Memorial Day weekend! 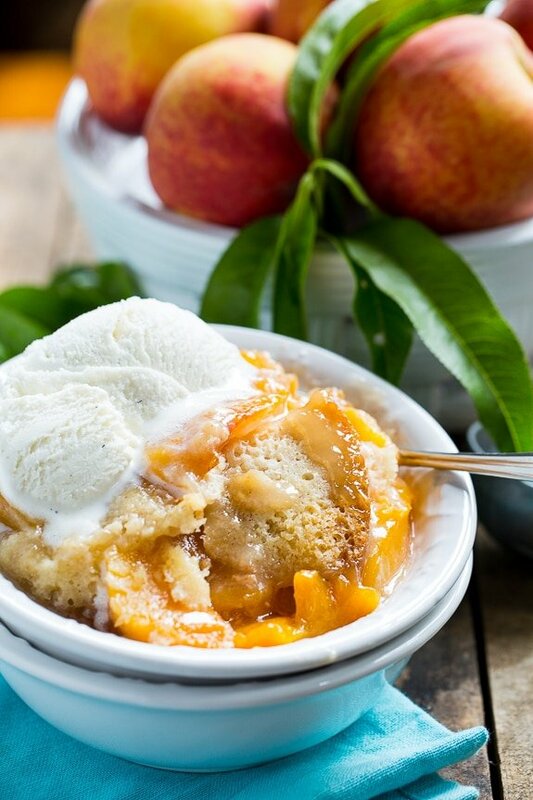 Oh my goodness this cobbler is making my mouth water! The best part is that it is chocolate!! So decadent and amazing! Chocolate cobbler??? Why have I never made this before!! It looks fantastic! Have a great holiday weekend!! I totally second Ashley here!! I want it now now!! 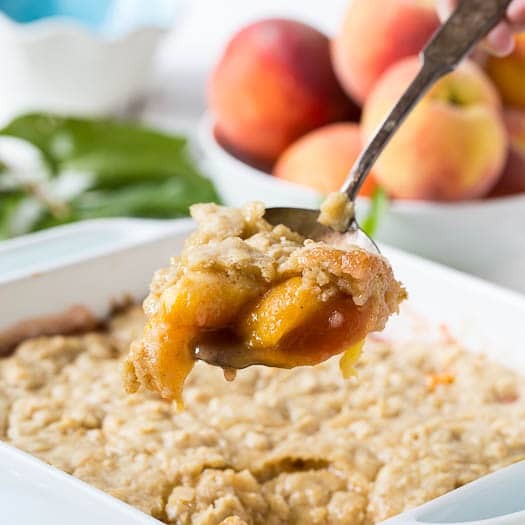 Wow this looks like the ultimate cobbler, Christin! This is seriously calling my name! Looks so decadent and delicious! Pinned! This is a gorgeous dessert! I can almost smell the chocolate. Oh. My. Gawsh. Christin, this is seriously the most genius thing I’ve ever seen! Chocolate cobbler! Who knew? After seeing this, it’s kinda gonna be hard for me to be happy with plain ‘ol fruit cobbler again. How awesome would this be with a big scoop of vanilla ice cream?! I haven’t even eaten breakfast yet and I want to face plant into this chocolate cobbler! I know quite a few people who who would love this and can see myself making it very soon!